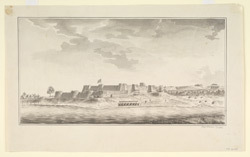 Pen and ink drawing with grey wash of Mangalore fort by George Goddard (c.1765-1797) in 1783. Inscribed on the front is: 'George Goddard. Engineer 1783' and on the reverse: 'S.W. View of Mangalore Fort from the Sand Bank in ye River, taken by George Goddard Engineer. December 4 1783'. Mangalore is a coastal town in Karnataka and has been historically important as a trading centre. In the mid 14th century there were over 400 Muslim merchants residing here. From 1640 to 1763 it was the stronghold of the Bednur Raja despite being attacked three times by the Portuguese before succumbing Haidar Ali, who made the town his naval headquarters.